Composer Justin Hurwitz speaks with actor Ryan Gosling on the set of “La La Land.” Hurwitz credits his Harvard education with opening up “a lot of possibilities to me as a composer." Justin Hurwitz never even considered conservatory training. An accomplished pianist, the Los Angeles native wanted more from his college years than countless hours of practice and rehearsals. So he attended Harvard. And it changed his life. “I knew I wanted to study music but I also knew I wanted to go to school with a more diverse group,” said Hurwitz, whose score and original song “City of Stars” for the musical “La La Land” earned Golden Globes earlier this month, intensifying the Oscars buzz that has been swirling around the movie since the fall. On Tuesday, “La La Land” received 14 Oscar nominations, a tie with “Titanic” and “All About Eve” for the most in Academy Award history. The film, a love letter to song-and-dance spectaculars from the ’40s, ’50s, and ’60s, stars Emma Stone and Ryan Gosling as struggling artists who dream of making it big in Hollywood. The storyline struck a chord with Hurwitz, whose own dreams of success began taking shape in Cambridge in 2003. A shared love of music brought the pair together. As freshmen they jammed around Boston with their Brit-pop-inspired band “Chester French” — Chazelle on the drums, Hurwitz on a Fender Rhodes electric piano. “We were just kind of drawn to each other,” said Hurwitz. Sophomore year the pair left the band, but their friendship deepened. As roommates at Currier House, in a space crowded with desks and Hurwitz’s piano, they pushed each other’s artistic boundaries, skipping parties and nights out to hone their respective crafts. Soon they were working on the jazzy musical “Guy and Madeline on a Park Bench.” The film, Chazelle’s senior thesis and a precursor to “La La Land,” made a splash on the festival circuit in 2009. Industry insiders took note. In 2014, came their next collaboration, “Whiplash,” an unflinching look at a rising jazz drummer, his abusive instructor, and how far some will go for their art. 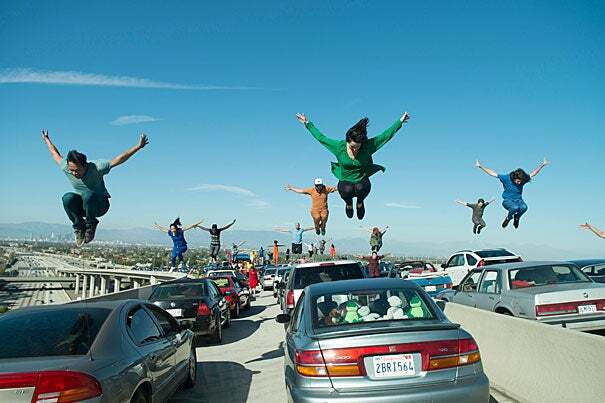 The movie earned critical acclaim, three Oscars (sound mixing, editing, and supporting actor), and the backing Chazelle needed to finish “La La Land,” a project he had begun in 2011. Though Chazelle didn’t write the screenplay for “Whiplash” until after he had moved to Los Angeles, the story reflected some of the drive and determination of those long nights at Currier House, Hurwitz said. For Hurwitz, part of the answer was an eye-opening class, “Music 51,” which he called “the most life-changing thing I did at Harvard.” Professor John Stewart used Johann Sebastian Bach’s chorales, complex works for four voices that are widely considered masterpieces, to introduce his students to the building blocks of composition — counterpoint, rhythm, timbre, harmony, and form. In 2005, Professor Joshua Fineberg worked with Hurwitz for an independent study on orchestration. They examined various scores, including the original piano work and later orchestrated version of Modest Mussorgsky’s “Pictures at an Exhibition,” and explored ways to write for particular instruments. Fineberg, now at Boston University, lauded Hurwitz’s drive to carve out his own path at Harvard and pursue his dream of scoring music for films. Today Hurwitz brings the rigor he honed at Harvard to his work with Chazelle. He begins by plucking out a tune at the piano that he records and emails to the director, who typically says “no.” Hurwitz keeps sending files until finally the right answer comes back: “That’s incredible. I love it.” The process can take weeks, and involve hundreds of rejected clips. Though “La La Land” was inspired by past musicals, including Jacques Demy’s “The Umbrellas of Cherbourg” (1964) and “The Young Girls of Rochefort” (1967), Hurwitz was determined to give his score a unique sound.